Just north of Phoenix, we dropped in elevation enough that the saguaro cactus so stereotypical of Arizona made their appearance. 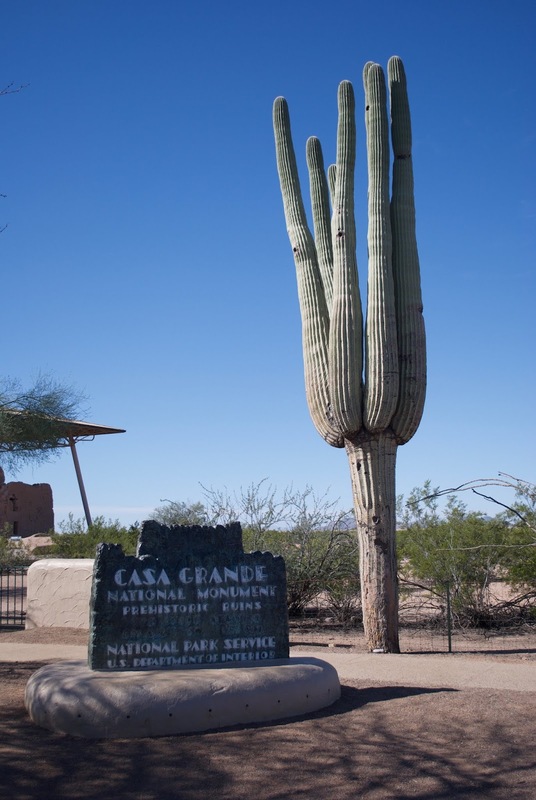 Casa Grande National Monument was only a couple of miles from the RV park. 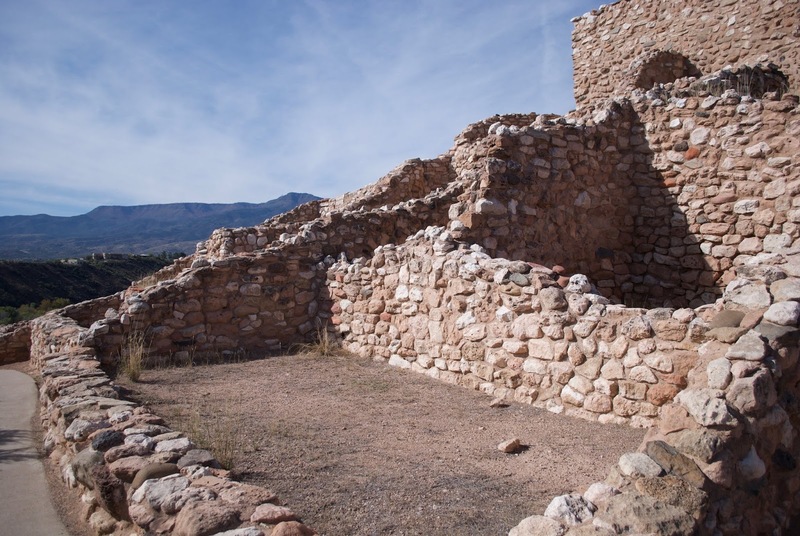 It was the first protected ruins as it was on one of the major trade routes in the area. Even in the 1800s, people would stop and carve their name into the wood and soft clay walls and even break off pieces of the wall as souvenirs. The largest structure, Casa Grande itself, has four levels and is protected from the elements by a large roof. The current roof was built in the 1930s to replace the original one. The walls of Casa Grande are very thick and wooden beams supported the roof and floors of the different levels. Occasionally, you could see where modern bricks and mortar was used to reinforce the structure. There are some interesting elements such as small holes in the thick walls which line up with sunset only on the equinox. It is assumed that this was a method of resetting their calendar probably for planting as this was an agricultural society. A large canal system for moving water from the Gila River into the fields around Casa Grande all constructed with just wooden tools. 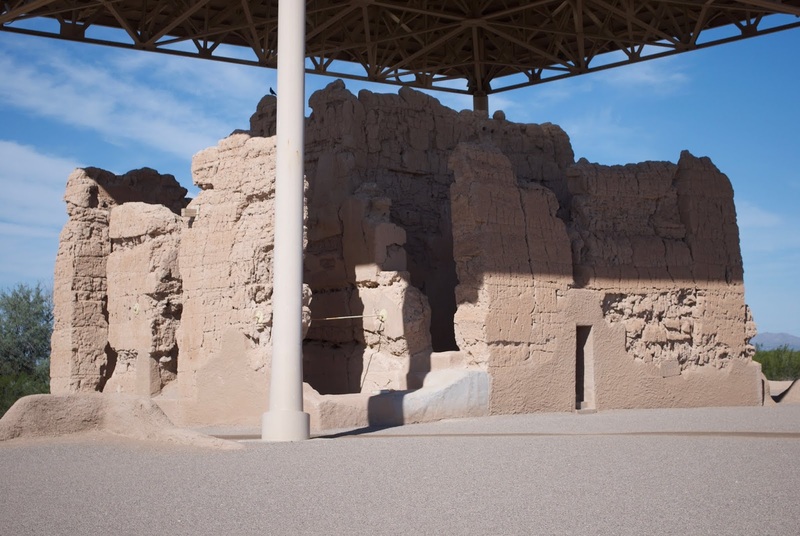 Archeologists believe that this complex of multiple dwelling sites surrounding Casa Grande supported a population of around 2000 individuals. They speculate that the people of the area moved on once the existing aqueduct system could no longer support their population growth. They were a victim of their own success. 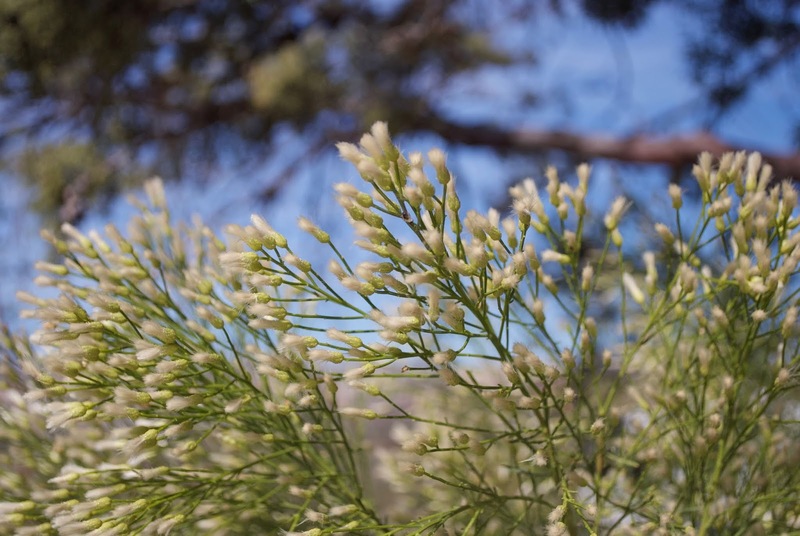 I noticed that the desert vegetation seemed really green so we asked the volunteer at the visitors center. Apparently, this area experienced some heavy rainfall recently and the normally grey vegetation greened up as it does in the spring. 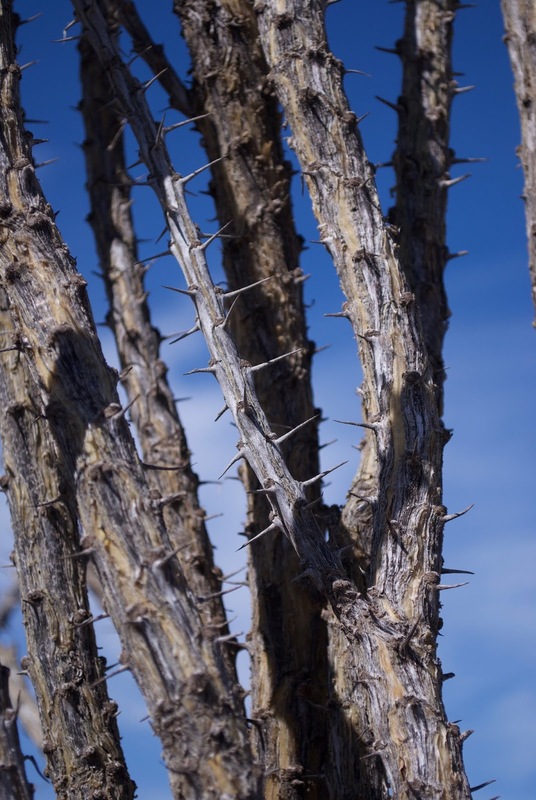 Quite a few of these spiky bushes are now covered with little oval green leaves when normally they look like a pile for grey, spiky sticks. Or at least that's how the volunteer described them. A relatively short day mileage day but having to go through downtown Phoenix was a bit too much civilization for me. At least it wasn’t during rush hour. We are in an RV park that we found on Passport America in Coolidge, AZ. I think it is mostly a mobile home park that has a bunch of spaces for RVs during the winter. It has a nice pool and hot tub and is very quiet. Nothing really special but it’s only for a couple of days. This rig was at the TT campground in Verde Valley. I thought it was pretty cool. 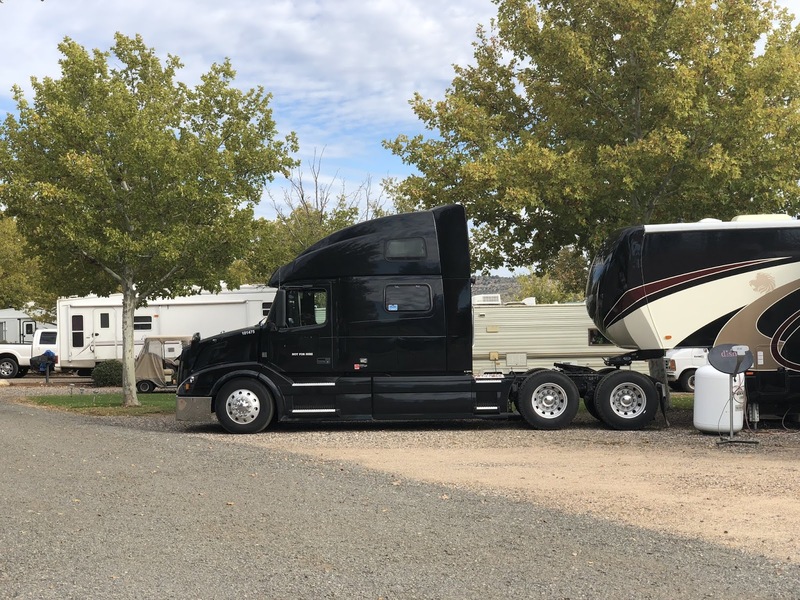 No problems towing the “little” toy hauler. I think they are here for a while evidenced by the large propane tank next to the trailer. He told me that the used Volvo tractor was about the same as you would spend on a new one-ton dually so he considered it a decent option. We are here for just two nights and then we head for our next TT campground on Thursday. This will be our first experience with an Encore park that we get with the Trails Edition add-on to our TT membership. Most of them seem to be more upscale than the TT campgrounds and they have some additional rules which will limit our use. We will be there for a week. That will give me time to arrange storage for truck and trailer somewhere near the airport. We met another ham friend from Fairbanks, Mike (AL7F) and his wife Pat for dinner in Chandler, AZ, at a BBQ place. They just moved into their motorhome after driving their truck from Fairbanks to Arizona in five days. Another quiet day at the campground. Just a quick trip into Cottonwood for groceries and diesel. $2.999/gal with my Fred Meyer card. Too bad I had partly filled up just after getting off the interstate before arriving at the campground as fuel is more expensive next to the interstate. I rode the e-bike around a bit more today including checking out a small winery right next store to the campground. A nice dirt road. The fat tires make for a comfortable ride on the dirt road though it is a challenge to moderate your speed. The pedal-assist setting gets changed often to get just the right amount of torque. These two pictures were actually taken yesterday at the Tuzigoot Monument. I just thought that this tree, whatever kind it is, looked kind of interesting as did the houses on the neighboring hill. I'm sure they paid a premium for that view. There is still at least one maintenance item for the RV. I picked up some rodent-resistant spray foam to seal up the openings in the plastic underbelly of the trailer. These are small openings around plumbing drain pipes that could allow small rodents into the underbelly. I also need to seal similar openings in the floor of the RV. This is in preparation for storing the RV in a couple of weeks when we fly back to Fairbanks. I picked up the spray foam yesterday but I may wait until we are at an RV park with a concrete pad instead of crawling around on gravel. Today, we visited three national monuments in this area. Free admission to all of three with my lifetime senior pass otherwise it would've been $10/person. I guess it’s one advantage of getting older. 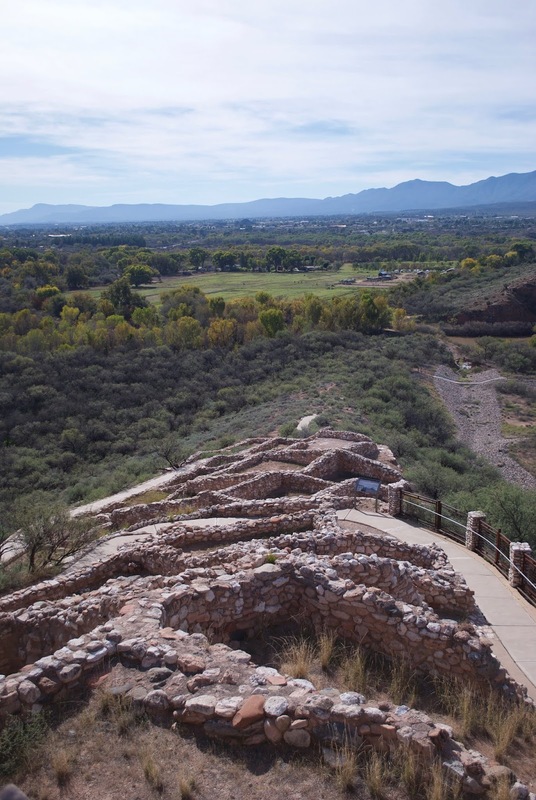 The first was the Tuzigoot National Monument. The dwellings have been restored with modern concrete used to stabilize the stone walls, especially where rain would erode the mud. This is a fairly large group of dwellings and it’s nice to be able to walk through them. The location on top of the hill allowed them to see their neighbors on adjacent hills. This site is the most excavated and restored in the area and many others have been located. 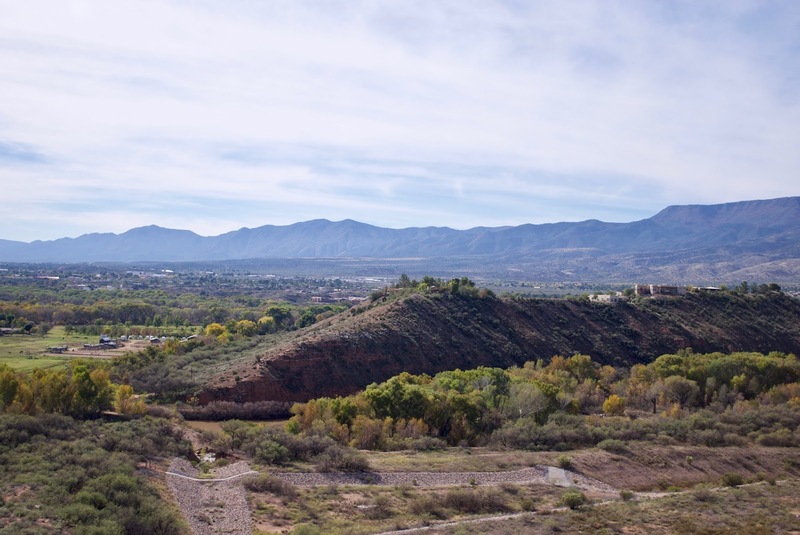 The surrounding area including the Verde River is absolutely beautiful. It was warm enough without being hot. And, even though it was Sunday, it was not overly crowded. This is one of the support posts inside of the hilltop dwelling. 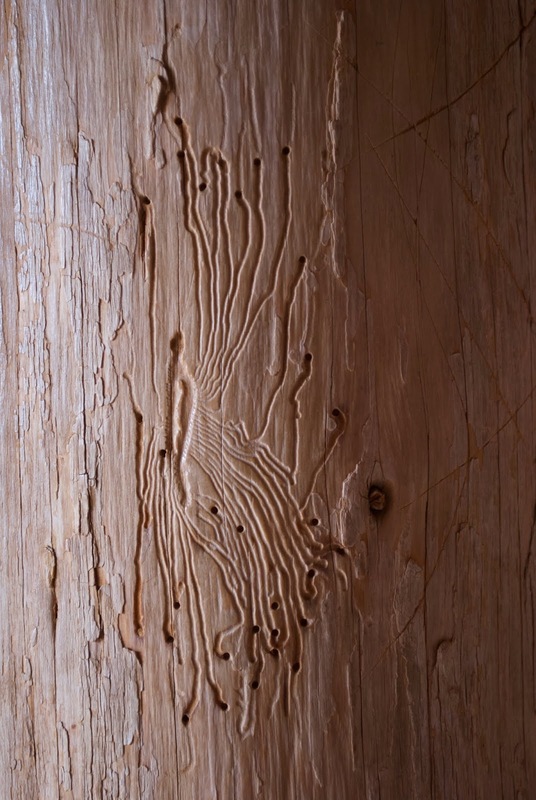 At first, I thought that this was the work of vandals but upon closer inspection, it’s insects of some sort. They burrow just under the bark and their tunnels are revealed when the bark is removed. 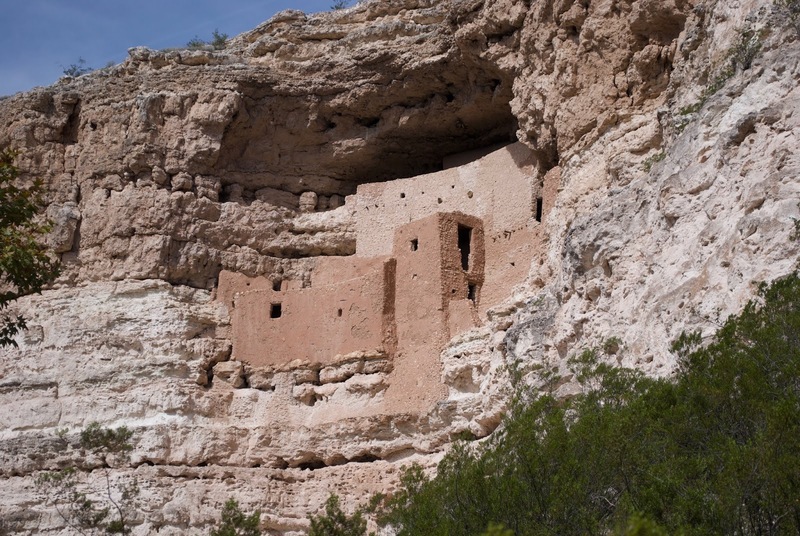 The second national monument was Montezuma’s Castle. 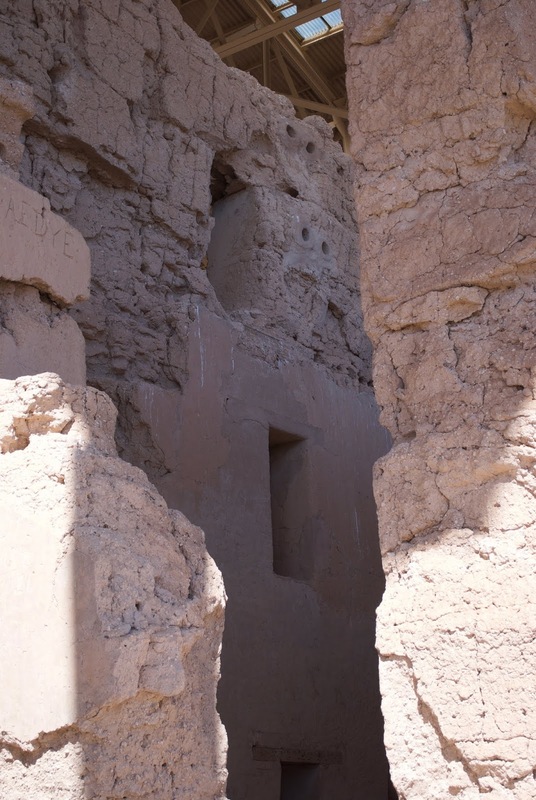 This cliff dwelling has twenty rooms. Until 1951, they allowed people to climb up with ladders but after the Interstate went through, the increased tourism shut that down. The display says that there are five levels to this dwellings and supported a fairly large population. 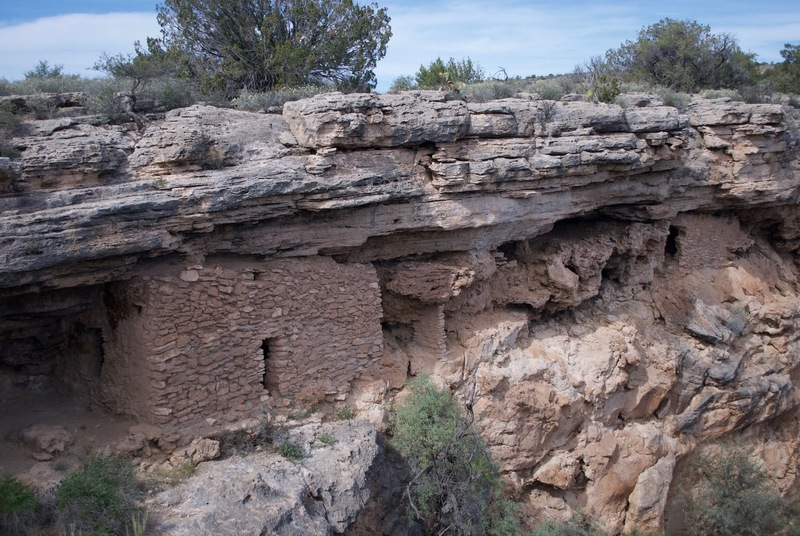 In addition to the cliff dwellings, there are numerous rubble piles from other structures on the top and bottom of the cliff. 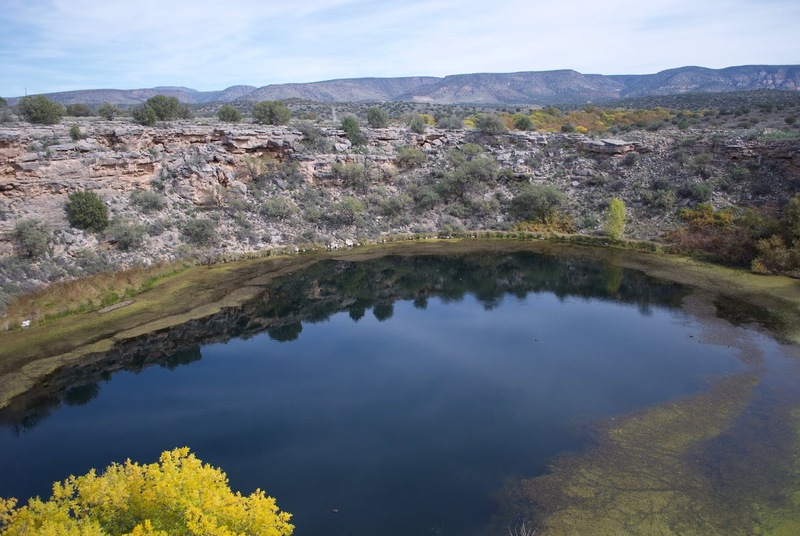 The third national monument was Montezuma’s Well. BTW, the name “Montezuma” was given by those that initially found them not because of any tie to the Aztecs. There are quite a few dwellings in the cliffs as well as the surrounding area. The water is 55’ deep and is fed from underground springs and has been providing irrigation water to the area for centuries. They mentioned that the water has a high arsenic content and would gradually kill anyone who drank a significant amount of the well water. But the exit from the well feeds into a creek which sufficiently dilutes the arsenic. The elevation here is around 3000’ but you can see evidence of fall everywhere. Nighttime temperatures are in the upper 40s (°F) with highs around 80°F. Warm enough to sit around the pool but it gets kind of cold if you’re in the water too long. I dug the pedal-assist bike out this morning and rode around the campground. The pool is less than a mile but still, it would be quite the walk back due to the warm temperatures and hilly terrain. This is the "H" campgrounds where we are staying. It is uphill from the "A", "B" and "C" sections which are near the pool. There are also some tent areas as well as long-term leased sections. The e-bike makes riding pretty easy even with the hills. Pedaling is still required but not much. Especially if you want to stay within the park speed limit. The pool is actually heated so I will definitely be back this afternoon. Internet within the lodges is definitely decent enough and our space is anout 100 yards from one of the lodges and the Ubiquity antenna can pick up the lodge wifi. I did need to move the antenna to the rear living area to have fewer obstructions. A lot less bandwidth that if you are in the lodge but sufficient. This is convenient as Verizon is kind of marginal and Verizon (and AT&T) will route voice and text over the Internet. Between one and two bars of LTE but zero throughput at the campsite. BTW, we do not have an external cell antenna like many other RVers as the Internet is really only needed for these blog posts. I have been using the Raspberry Pi DMR hotspot when stopped. It needs an Internet connection to reach the bridges. Radio frequency is only used for me to communicate with the hotspot. I'm using simplex on a UHF frequency (70 cm band) so the range is very limited. Especially since the hotspot radio is only a tenth of a watt. Very little bandwidth is needed. So far, about all I’ve used the hotspot for is participating in the Alaska statewide DMR net on Monday evenings. And talkgroup 310 which is North America. Another five-hour travel day from Needles, CA, to Verde Valley RV Park near Cottonwood, AZ. On the way, we went over a 7300-foot pass near Williams, AZ. It was actually a pretty relaxing drive even though we must've been the slowest ones on the road at a sedate 60 mph. This is faster than the 55 mph speed limit that California has for trucks and anything pulling a trailer. As you might guess, it was largely ignored. We had no idea what to expect at this TT park. It turns out to cover a large area. We are near one clubhouse (pictured below) and it's a 1½ mile drive to the pool at the second clubhouse. The clubhouse itself is pretty nice with decent wifi. The ranger at the gate made a point of letting us know of the upcoming activities such as potlucks. These sites are closer to an RV park rather than a campground. But the roads are mostly gravel as are the pads. And there is a significant slope to most of the sites. Not enough to really bother us. Here is the mini golf course next to the clubhouse. It looks like it's in pretty good shape as are most of the things. I discovered that our sewer connection works if the flow is limited. Not a big deal as we've had full hookups for a while. We also have full hookups at the next two RV parks. We are here for four nights then move on through Phoenix towards Tucson. This morning, we made our first long-duration reservation for the 2019 road trip. We liked the Needles Marina Resort well enough to inquire about a month-long reservation for next February. They still had a couple of spaces so we went ahead and made a reservation. That is probably the most crowded month here in the southwest. Snowbirds are already starting to arrive. And this park is pretty full with folks who look like they are here for a while. 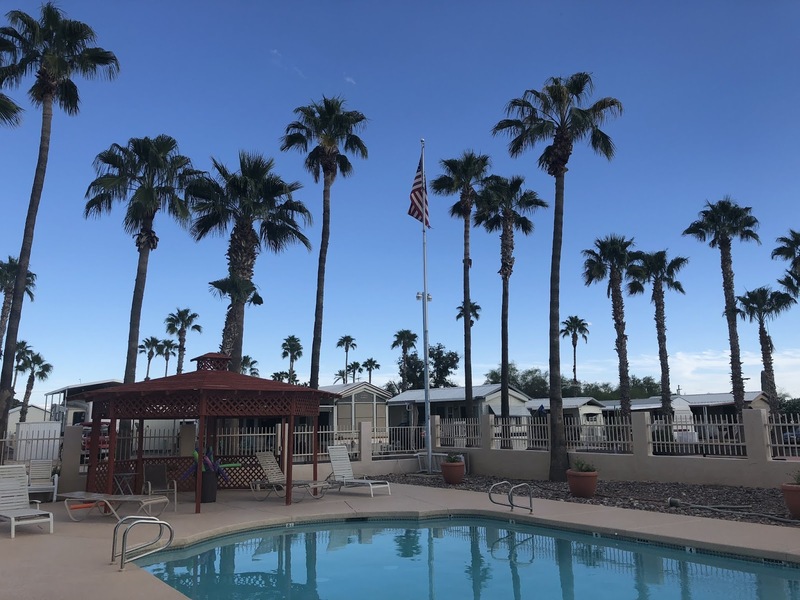 We extended one more day at the Needles Marina Resort on the western shore of the Colorado River. 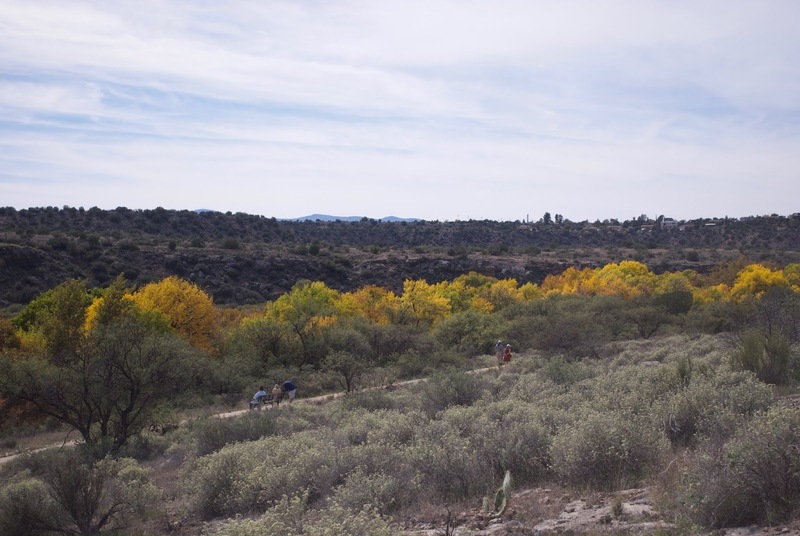 The original "plan" was to head about halfway to our next reserved campground near Cottonwood, AZ Verde Valley RV Campground which is another TT property and the only TT property in AZ. 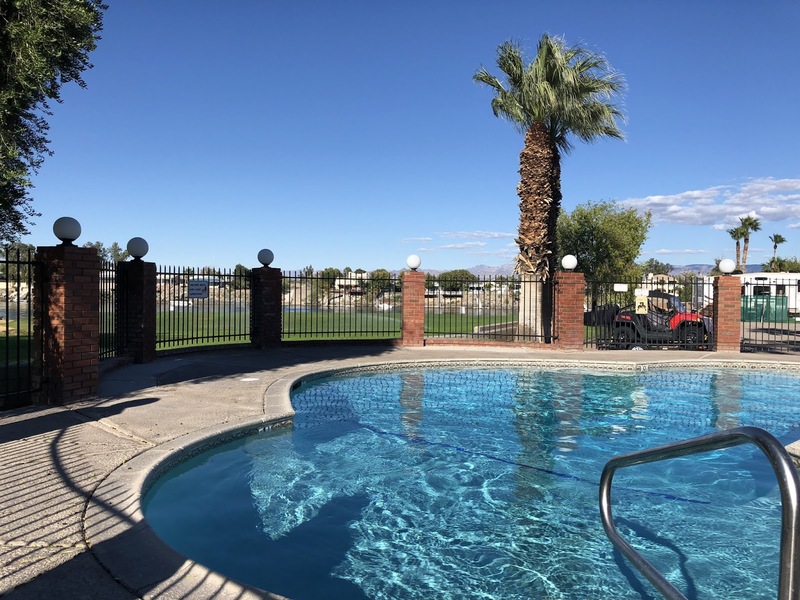 To supplement this, we purchased the Trails Collection package which adds about a hundred more campgrounds across the country that are part of the Encore network. More on this later. Google says that it’s 269 miles east by road (it’s not a straight line) with some significant elevation change between here and there or probably a five to six hour drive. It turns out that our biggest non-normal expense on these trips is diesel fuel with campground fees the next in line. Our normal travel days seem to be about 250 miles which cost about $70 to $110 depending on where we are. Since we left Fairbanks, we traveled 5634 miles at a cost of $1242. Of that, $502 is for the trip from Fairbanks to Sunriver, OR. So for RV travel, $735. Our normal fuel spending for the same 40 days would be less than a tenth of that. The TT membership was paid in August but we have stayed 18 nights within their network for $0 per night. We still have reservations for another 11 nights. And 16 nights at RV parks or campgrounds and these ranged from $16 to $42 per night. Six of these were using Passport America so these are near the cheaper end as it is a 50% discount. For the remaining 10, we used our Good Sam's 10% discount. So we'll average it out to about $33 per night or around $528. Instead of traveling this much, we are considering maybe finding somewhere to stay for maybe a month. Originally, we were thinking that we could do two week stays at some of the Encore parks in AZ but most of them have 30-day minimums during their busy season. Also, some have RV age restrictions and ours is over their limit. So the Trails Collection may not have been too useful but for the $200 per year, a one week stay is past the break-even point. The project of the day was replacing the lavatory faucet. A couple of days ago it started to drip. Instead of figuring out what particular faucet parts were needed, I just replaced the fixture. The new one looks better in my opinion. Oh, the joys of an old RV. Kind of like a house only simpler. 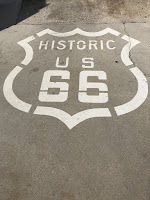 The Route 66 logo was painted on the road going through downtown Needles. This was taken at the hardware store where I picked up the faucet. Yesterday, the propane ran out again much sooner than expected. Through Oregon and northern California, one 30# tank was lasting about a week with the furnace being the major consumer of propane. Now that we were in much warmer temperatures, the furnace doesn't come on that often so running out after only 5 days was a little baffling. Yesterday, Bridget thought that she smelled propane when sitting near the refrigerator. All of the appliances that consumed propane were in that area. The refrigerator, furnace, stove/oven, and hot water heater. The connections for the refrigerator and water heater were outside of the living space of the RV but the stove/oven and furnace connections were inside. There was a slight smell after opening the cool air return vent on the furnace. The connections were tight but the soft copper gas line had two small wear points where it was rubbing against the steel vent. Soap water didn't show any leak but I taped over the wear marks on the gas line with self-fusing silicone tape aka rescue tape. No more smell. I'll need to cut the line and redo the fitting at the end. It looks like a ⅜" flare and I don't have those tools with me. That tape will hold just fine and I moved the line to eliminate the contact with the sharp edge of the vent cover. Rescue tape is wonderful stuff. We drove across the river this afternoon for groceries and diesel. In Needles, CA, $4.959/gal. In Mohave Valley, AZ, $3.08/gal. I'm not sure how the stations manage to stay open on the CA side of the river. The second picture is the campground pool. 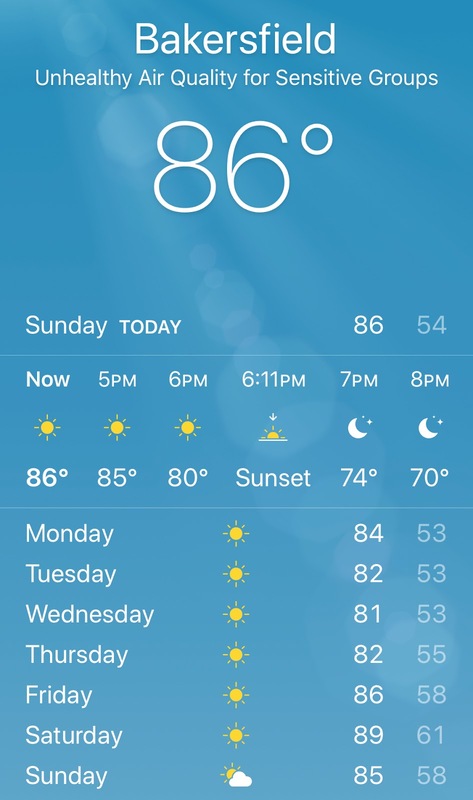 92°F this afternoon. It was a perfect day to sit in the unheated pool. BTW, iOS now allows Blogger access to the photo library and the camera within the website. No more messing with Google Photo to add pictures to albums to post on the blog. This change really does make the computer “optional”. Another five-hour drive today but we are on the Colorado River. 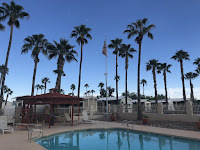 We are staying at Needles Marina Resort and it is another Passport America campground. So 50% off. They went ahead and gave us a riverfront site with full hookups for $26/night even though the app says the PA discount doesn’t apply to riverfront sites. For the view, that is a great deal. The picture is the view from our campsite. Not too shabby. I'm glad we opted for this place instead of a boondocking site in the Mojave. I remember going through Needles years ago and wasn't very impressed with it. But, that was in the middle of the summer and my '77 Toyota pickup didn't have A/C. The drive from Bakersfield was pretty uneventful. Some crosswind right before we got Needles. Nothing to justify the wind warning highway signs in Barstow. We passed Pisgah crater and Ludlow about an hour east of Barstow. Back in 1975, this was my first field trip only a couple of days after starting my summer job at JPL. My only qualification for going on the trip was being able to drive a stick shift 4WD truck, follow directions, and carry a backpack. The truck was one of the old crew cab, short bed International Harvester pickups with three gas tanks including one in the front fender behind the passenger front wheel. I haven't been through this area in a long time. We are here for at least two nights maybe a third if we like it here. After this, we will be at a Thousand Trails campground near Flagstaff. I'm really enjoying this slower pace of travel. Everyday travel with the RV isn't the same as on the motorcycle. Once you're set up, it's nice to stay for a while. The thermometer says that it's only 73°F outside but working in the sun, it felt really hot. I removed the stuff from the cargo carrier to simplify access to the shredded wires. Cut out the shredded part and spliced the wires together again. This time, I zip tied the trailer harness well away from any sort of edge. I also zip tied the four pin trailer connector to the drawbar to prevent any movement. A quick test showed that all of the lights worked fine. I'm still not sure how the bicycle cable and wiring got damaged. I'm hoping that it wasn't someone trying to cut the cable. Filled up the truck again and fuel is slightly cheaper here at $3.959/gallon. Since we did all of our shopping errands yesterday evening we are left with a quiet, relaxing day but at a location with both decent wifi and a strong Verizon signal. Quite a change from the last four days. Tomorrow we start to head east and a little bit south towards the Colorado River. I'm thinking of stopping in Needles, CA, for a couple of days at another Passport America campground right along the Colorado River. I looked at several boondocking sites between Barstow and Needles and they all were either far from the highway with recommendations for shorter RVs only or really bad reviews. Today was a long travel day as far as time and not miles. About six hours for 280 miles. The first three hours were in 2nd and 3rd gear winding up and down through the mountains. Very scenic but 10% grades were the norm. They would be great motorcycle roads but not ideal RV roads. We are back at the Orange Grove RV Park in Bakersfield for the next couple of days. We stopped here before last year on our road trip. Kinda expensive but a nice RV park. I remember spending some quality time in the pool. At the pool but it is freezing. Maybe not really freezing but cold. It does look refreshing though. And after only five minutes, I’m no longer feeling warm. It’s called “Orange Grove” because of the orange trees between the sites. BTW, I think I discovered the reason for the trailer light problems. I noticed that only the tail lights were working on the cargo carrier. Upon closer inspection of the wiring harness, the wiring for the four pin trailer connector at the back of the trailer was trashed. Right next to the badly frayed wiring, the heavy cable I have securing the e-bike was damaged. Tomorrow, I'll fix the wiring and examine the cable more closely,. I guess that I’ll pick up that heavy chain that I was considering last summer. And probably start putting the bike in the back of the truck locked to the hitch. 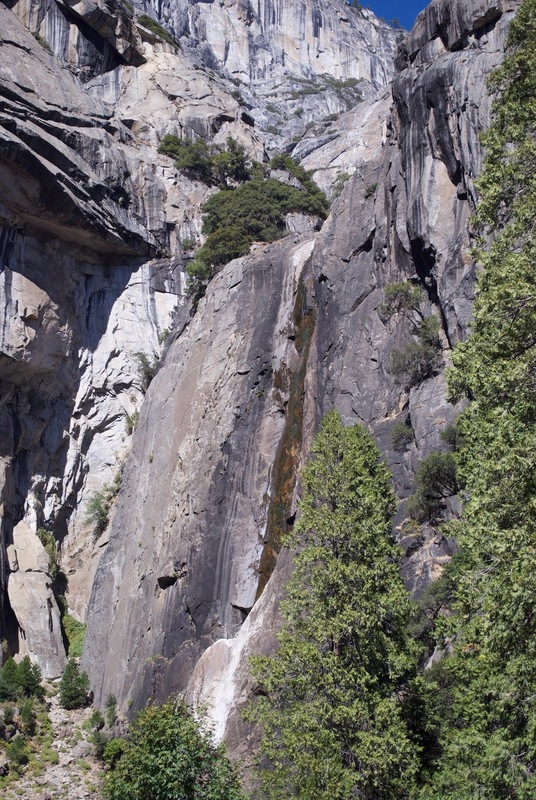 Yosemite Lakes RV Park is our fourth location within the Thousand Trail network of campgrounds. It, like the others, is more campground than RV park. There were some back in sites right along the river but we didn’t need the debris from the trees on our roof. Plus, wanted to run a battery equalization cycle and that requires full sun for over three hours. Most, if not all, of the sites appear to have full hookups and at least 30 amp power. The only negative is lack of Internet at any of the campsites. What is different is that they have separate area for TT members and non-members. They have two satellite connections but whomever set up their network is handing out real IP addresses. As you might guess, that’s a pretty small number of people who can get on the Internet at any one time. The network mask is 248 and if you discard the broadcast address, the network address and the gateway address. You are left with a grand total of 5 addresses available through dhcp. I never noticed this until today as I just used the network for blog posts. The gateway has a real IPv6 address and is sending out router advertisements on WiFi so my devices make up a real, routable IPv6 address using a process called stateless auto-configuration or SLAC. This works great as long as the services and destinations you use have IPv6 connectivity. Google services do. This means that Blogger, Gmail, Google Photo, etc. all work fine. And since my email domain is hosted by Google, it worked fine as well even without a real IPv4 address. Mac OS X and iOS both work with IPv6 just fine unless you disable it. We didn’t explore any today since it’s Saturday. I didn’t want to deal with the crowds. Even here at the RV park it’s a lot more crowded starting last night. We head out again tomorrow morning. Today we went back into Yosemite National Park to visit a couple other locations. Last year, we went to Bridal Veil Falls and there was so much water pouring down, that you got drenched just walking up the trail. Not so this time. This is taken from the end of the trail, But at least there is still water coming down. 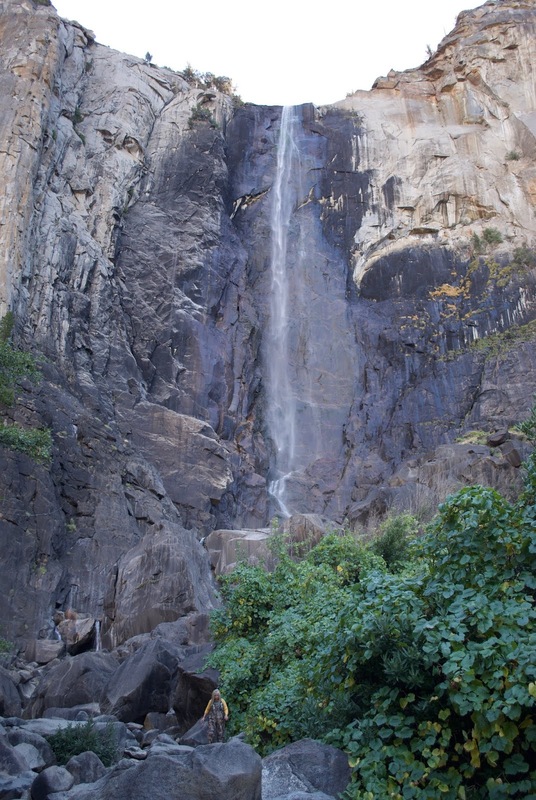 According to the posters at the base, this waterfall is being threatened by its popularity. 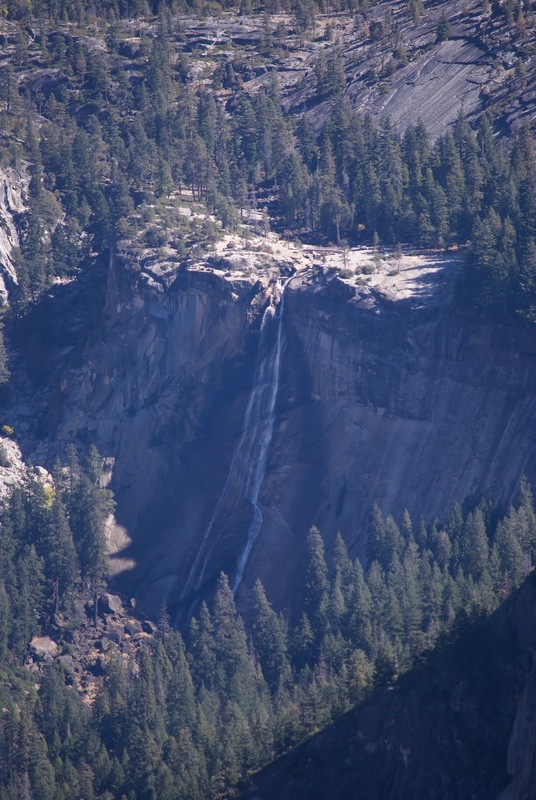 It's the first waterfall that people see upon entering the valley. We then headed up the road to Glacier Point. From the valley road, you head south towards Wawona but after climbing out of the valley, you turn east and drive along the southern side of the valley. 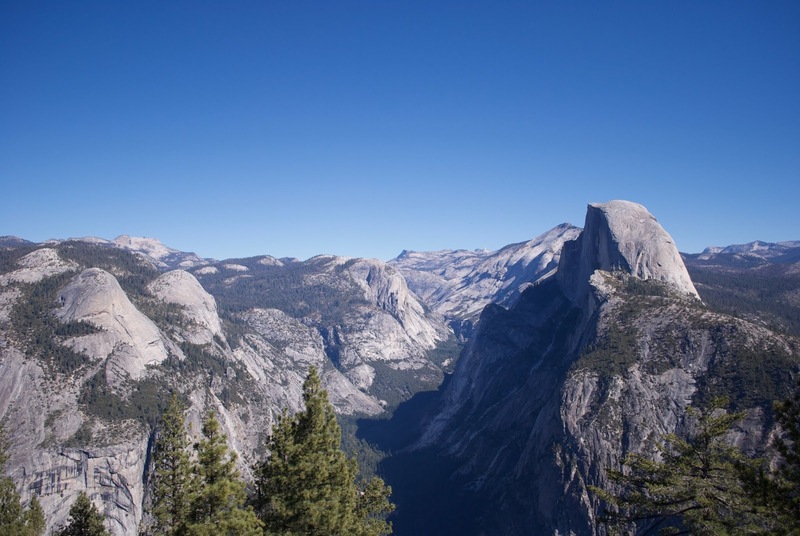 This pano was taken from Glacier Point and you get a spectacular view of Half Dome. Something that we missed completely last year. Back in the late 1970s, I came here on a x-country ski trip with the JPL Hiking, Backpacking and Wilderness Gourmet Society aka hiking club. We stayed in condominiums near a down hill ski area. None of that exists anymore. I could tell where the downhill area was but just about all traces of it are gone along with all of the condominiums. 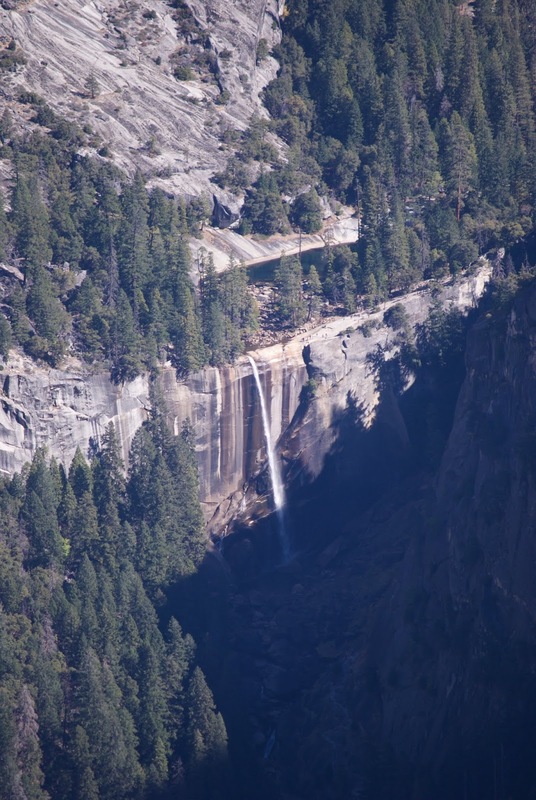 This is Nevada Falls as seen from the view point. I've never been all the way to Glacier Point before so these views are new to me. Several of us considered skiing here but the road was extremely icy. Those warm conditions and steep cliffs don't go well together. On the way back from Glacier Point, we stopped at Washburn Point for lunch. From here, we got a slightly different view of Half Dome. 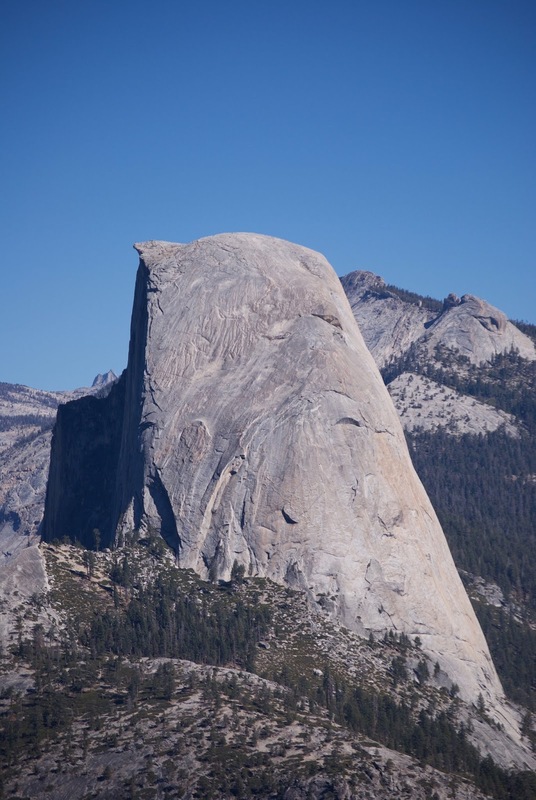 I guess there is a trail to the top of Half Dome though a permit is needed. The end of the trail is like the trail in Zion where you pull yourself up along a cable or chain. One of these years but probably not. We went back into Yosemite Valley as we had forgotten our national park passport book yesterday and I wanted to get it stamped. Plus, we were running low on fresh vegetables. We filled up with diesel on the way back to the campground and we now have a new high mark. $4.929/gallon. The station next to the campground is slightly cheaper but it's 20% biodiesel. This lowers the fuel mileage significantly. Vegetable based oil has fewer BTUs per gallon. So I'll pay more for non-biodiesel. 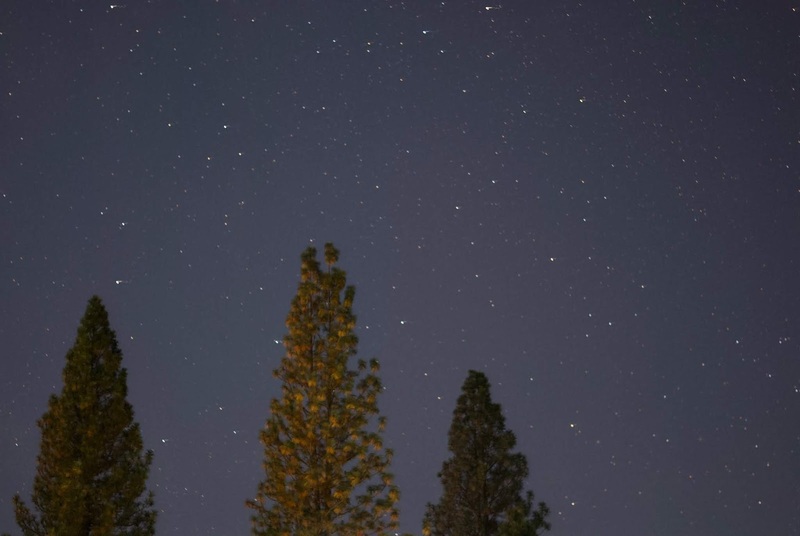 Last night, I tried to get some star photos as the campground is pretty dark and there is a lot of stars visible from the campsite. Especially after midnight. What turned out to be the most challenging part is manual focusing the lens to infinity. The auto-focus was unable to do anything. Looking through the viewfinder, it was hard to see anything. I ended up trial and error. This was ISO 800, 30 sec, 18mm F3.5. 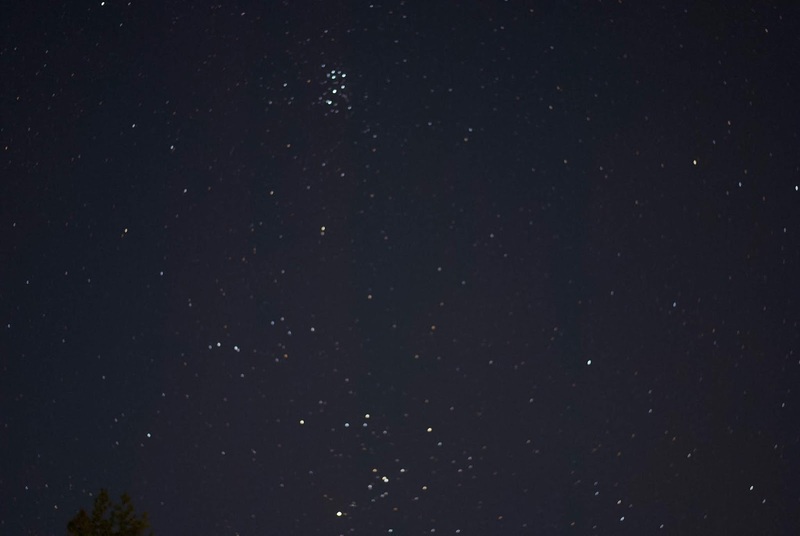 This is the Pleiades, an open star cluster easily visible. It seemed like a good first attempt. ISO 400, 15 sec, 55mm, F1.8. Maybe I'll try some aurora photos but the kit lens is only f3.5. The 55mm prime is f1.8. A bit faster bot wider angle would eliminate the star trails. Today, we went into Yosemite Valley. Not really crowded but many parking areas were still full. Not packed as when we were here last year. We walked up to lower Yosemite Falls and it was just a trickle. If you look really closely at the picture, you can see some wet rocks. That's the waterfall. The last time I was here was around 1980 and water was pouring down from the cliff. I don't remember the time of year but I think Spring because I also remember needing klister for x-country skiing. At the intersection of the road and the trail, there was something I hadn't seen for quite a while. 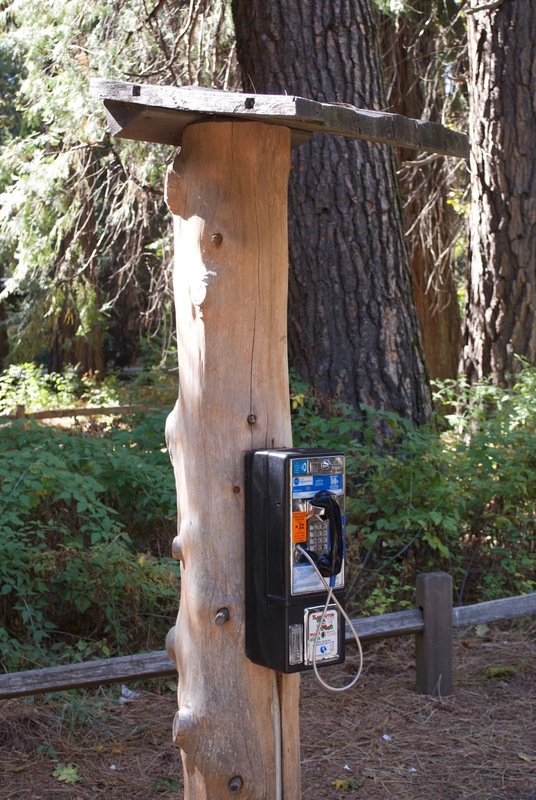 A pay phone. I'm not sure why as there was great Verizon signal inside of the valley. Here at the campground, no cell signal, and very slow Internet but it was good enough for this post so I'm not complaining. I should have brought my laptop and done the post while still in the valley. We ventured much further into the park this time. I was just so fed up with traffic last year and not being able to find parking that I just wanted to leave. Too many people. That wasn't the case this time. 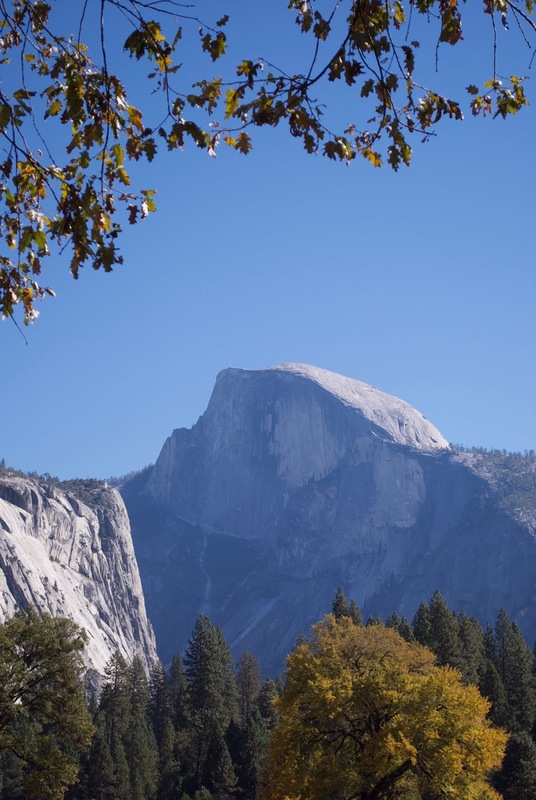 We got some nice views of half dome while walking on the trails around the parking lot. 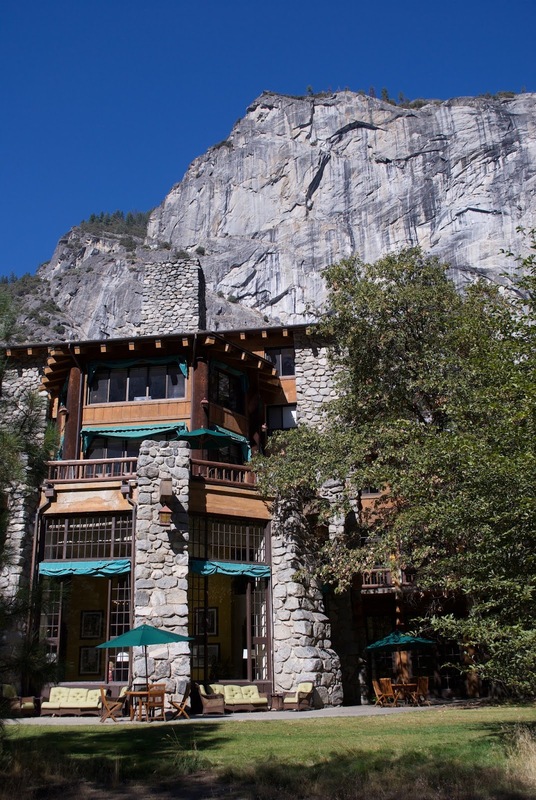 After lunch, we walked up to the Majestic Hotel formerly known as the Ahwahnee Hotel. Pretty nice but less impressive than the Old Faithful Lodge in Yellowstone. 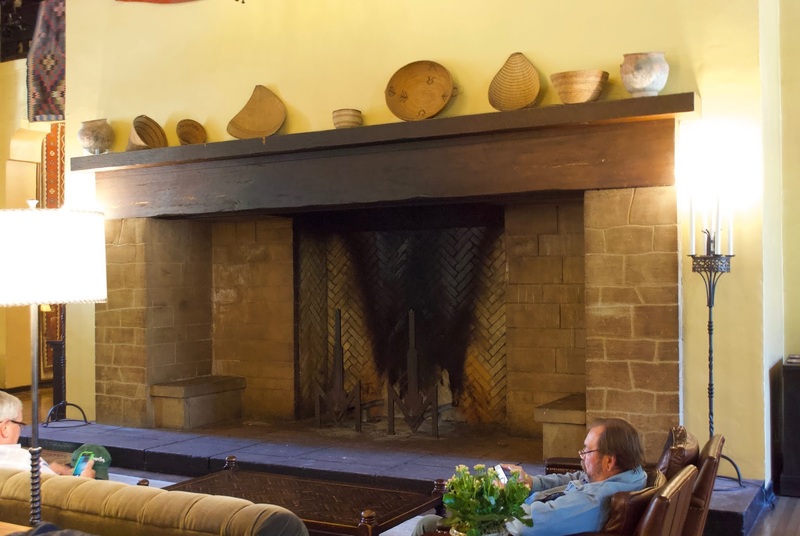 This is one of three fireplaces. The hotel was built in 1927 and it really is a grand place. Valet parking, fancy restaurants and all. From the hotel, we took the shuttle bus. Very crowded as a lot of people got on at the hotel which was stop number 3 of 20. The parking lot where we parked was stop number 1. So we got a nice tour of the valley floor. It is about a 45-minute drive from the campground to the parking lot. A little further than I thought given that the campground was only five miles from the entrance gate. BTW, this was my first opportunity to use my lifetime senior pass for admission to the park. You just present the pass and your ID so they can see that they match, We arrived back around 4pm. Today was supposed to be an easy 110 miles from Lodi to Yosemite Lake RV Park which is located about five miles west of the park entrance. Things started going sideways when the on ramp from Hwy 12 to I-5 was closed for construction. The first opportunity to turn around on Hwy 12 was about fourteen miles down the road. The turn around road was extremely bumpy and partway through, I noticed that the rear view camera was not working. Once we were back on 12 heading for I-5, I pulled over at a wide spot and discovered that we had lost all lights on the rear half of the trailer. The running lights and clearance lights on the front were on so it wasn’t the connector. We got on I-5 and Bridget found a very helpful RV service place in Stockton so we headed there. After about ten minutes, the lights started working again. We went ahead and stopped at the helpful RV shop to thank him and continued on. About ten minutes later, all of the lights stopped working. Since it was all of the lights I just removed and reinserted the connector and all was fine. We drove on to the RV park. The last 20 miles of Hwy 120 were very windy with a steep climb. Between the grade and the curves it was a 20 mph road. Sometime during the winding road section, the dining room table flipped over and the cabinet door with the Instant Pot in it opened up. It came flying out and the outer shell is now dented and the inner stainless pot is bent. I tried it making rice and it worked fine at least on low pressure. BTW, using the Instant Pot to make rice consumed 9.52 amp-hours from the batteries which is about 2% of our battery bank. I’ll have to go back and look but I think the rice cooker was about double that. Oh yeah, why are we on batteries at a full hookup RV park? When we arrived, all of the power was out and the clerk had no idea how long it was going to be out. It was back on at about 5pm. The trivet from the Instant Pot was missing which meant that it was under the slide. It was and we dug out pieces of the trivet while the slide was moving out. No cell phone signal and very limited Internet at the lodge. I’ll attempt to add one photo of the campground but I’m not very confident that I’ll succeed. So maybe no posts until Sunday evening. Bridget said not to expect anything on her blog until then. Hey it worked! We are in the non-shaded area on the far right. There were open sites backing up to the river but they would be really shaded and the sites were dirt. The one where we are at is gravel and grass. Unlike the other TT locations, this one has full hookups and they have a member area and a non-member area. The member side is pretty open. I was kind of curious about the peak current being around 17 amps. Since the front of the trailer was in full sun this morning i.e. all of the panels were not shaded, I headed up to the roof to test each panel. The easiest way to test the output from each panel was to cover them up one at a time and measure the total current from the charge controller. At the top of the web page from the Raspberry Pi monitoring the charge controller, I have this status block that updates every minute so I don't need to sit there and wait until the graph updates. The graph is a five-minute average. Anyway, with each panel covered, the current dropped by about 3 amps. So the reduced current from the panels must be due to the lower sun angle. The way the panels are installed, the two panels near the front of the RV are tilted slightly towards the sun. The two behind them are flatter. 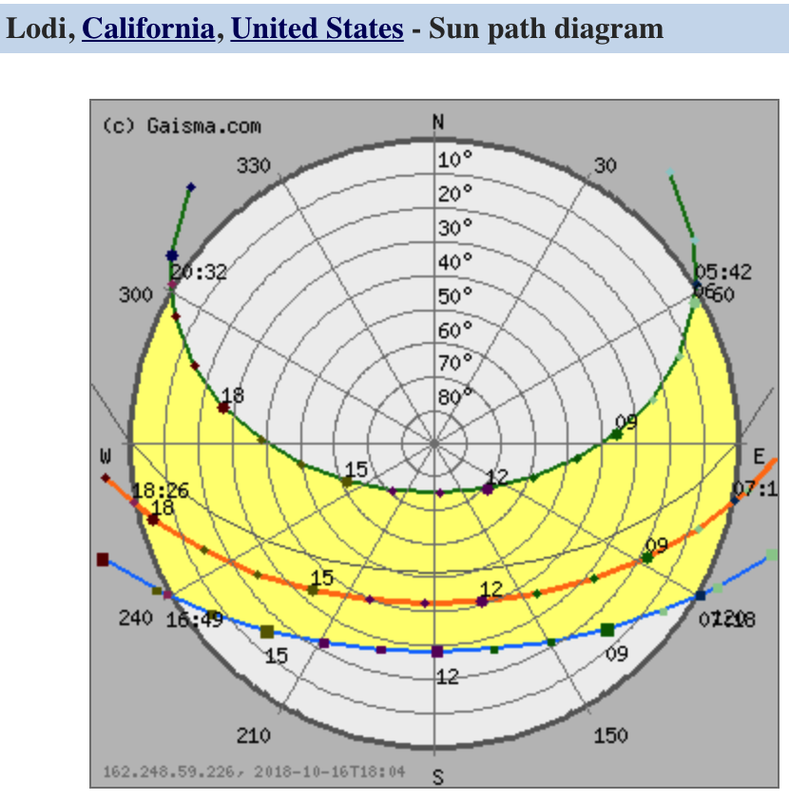 This graph of sun azimuth for Lodi, CA, shows that the angle is about 42° from the horizon. 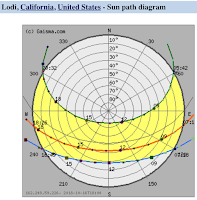 The sun angle for when we were in the area last year was 75°. Quite the difference. When the angle of the sun decreases relative to the solar panel, the area of the panel is proportional to the sine of the angle. Using 75° and 42°, the virtual area is about 70% of what it was. At the winter solstice it would be 50%. Two of the panels are shaded by a tree by 11am. so we are not in full sun for much of the day. Another "task" was cleaning out the storage bay. There was a lot of pine needles, bark, and other debris from the mat that we put in front of the door. While cleaning things out, I pulled out one of the bins I have in storage with spare parts and rarely used tools. One of the repair items was a spare disc that goes between the pinbox and the fifth wheel hitch saddle. 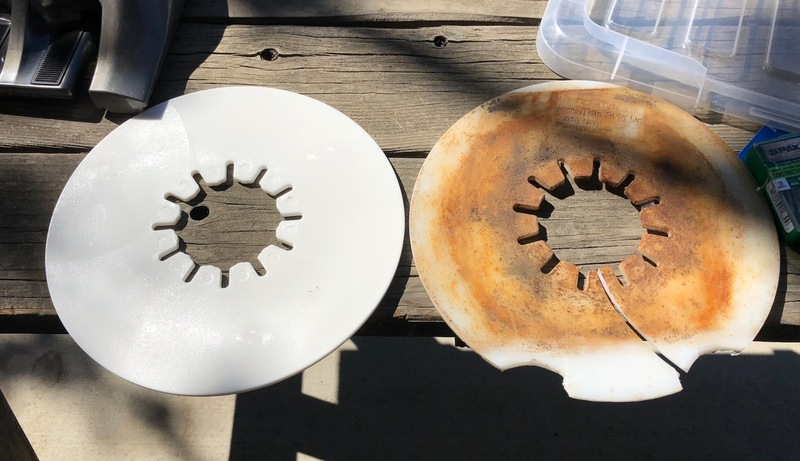 This plastic disc is used instead of grease. I had ordered one from Amazon a couple of years ago before we picked up the trailer. But, since it already had one, the new one got put into the parts bin. I think it's time to be replaced. I received notification that my Amazon order was delivered to an Amazon locker. This was the first time we tried using this service. I was annoyed yesterday as it was supposed to be here by the time we arrived in the area. It wasn't and the delivery date changed to maybe today or tomorrow. Anyway, we went to the locker location which, by the way, was the largest and nicest Safeway I've ever been to. Fantastic produce, well laid out and huge. We just scan the barcode from the Amazon delivery email and the appropriate door pops open. You then pick up your item and close the door. In this case, it was a replacement remote for the truck. You need a working remote to program a new remote and the one remote I have seems to have a weak battery. After all, it is 13 years old. The new remote programmed into the system by following directions on the Internet. Since this was simply a door lock/unlock remote, programming was very straightforward. And the replacement fob was only $12 on Amazon. I’m sure the dealer would have been a bit more. On the way back from our Amazon Locker experience, we stopped at Calivirgin olive oil. This is a small producer of local olive oil and balsamic vinegar. They had about a dozen flavors and it was difficult to make a choice. We ended up getting the sampler which had the lemon, basil, and garlic flavored oils. It also includes a bottle of their premium oil made from hand-picked olives and a bottle of balsamic vinegar. A nice selection. It was another 80+°F day today. Spent some time in the hot tub/jacuzzi and even though it’s too hot to spend too much time, when you get out the gentle breeze feels wonderful.